It is our pleasure to write this Letter of recommendation on behalf of Adam Wood, of A.C. Wood Contracting. Adam was the General Contractor for the construction project of a two-story two-car garage and breezeway at our home in the fall of 2016. We had no prior relationship with Mr. Wood, who was recommended to us by our Home Inspector. The scope of the construction included: Excavation and Foundation (including concrete pad driveway in front of garage pitched to drain and rebuilding of stone walls); Electric in the garage (including Electric sub-panel); Installation of Overhead Door; Painting; Masonry; and all aspects of the physical construction of the garage and breezeway. The project took 20 weeks and involved six work crews (excavators, concrete pourers, carpenters, painters, roofers (plus electrician and structural engineer) at a budget of just over $150,000. While major construction is inherently stressful for almost any home- owner, Adam’s services as a general contractor were invaluable, and we are extremely pleased with the final result. So much so that we have recommended him to friends, neighbors, and other local homeowners and businesses in the area. Quality of Work Performed: The quality of work done was consistently top notch. Adam used workmen and subcontractors who were knowledgeable, skilled, and competent in their respective trades. They were self-starters who were conscientious about following project specifications, and their work product rarely needed improvement or revision. Quality of Work Crews: The workmen whom Adam utilized were professional, reliable, courteous, and respectful of our property and privacy. They had excellent work habits, strong safety orientation, and emphasized getting the job done right rather than doing it quickly. Their pride in their work was evident. They tidied up the area at the end of each workday. We also found them to be exceedingly personable and felt more than comfortable allowing them free access to the inside of our home. Project Management and Coordination: Adam’s prior experience working in construction was invaluable. He was knowledgeable of all aspects of our project and was able to plan, coordinate and manage the activities of different work crews effectively. He remained closely involved in overseeing the project from start to finish. His work ethic, excellent attention to detail, strong organizational skills and commitment to follow-through are assets which enabled him to juggle the extensive details involved in our project without “missing a beat”. Adam’s familiarity with building codes and finesse in dealing with Great Barrington’s Building Inspector Ed May also facilitated a smooth and hassle-free process when it came to building permits and inspection. Integrity and Professionalism: Throughout the project, we were impressed with Adam’s commitment to generating a top quality product, rather than maximizing his profit margin. When situations arose where extra work needed to be done (because of hidden problems that were not apparent until work on the garage and breezeway had commenced), Adam either took care of it without charging us extra (if it was relatively minor) or involved us in an informed decision about increased costs (if it was more extensive) so that the solution was fair to all parties. Effective Communication: Adam kept us closely informed of his work crews’ schedules, delivery dates, and projected completion dates of different phases of our project. His communication (whether by text or cell) was always clear and concise, informative, and helpful. He was available on his cell phone, or returned our texts or phone calls within the hour. We never had a single miscommunication throughout the five-month project. His communication with the work crews was equally effective. Flexibility and Effectiveness in Dealing with Unexpected Developments: When unforeseen problems surfaced Adam worked diligently with us to identify a solution that was acceptable to us. He utilized resources effectively and creatively and directed the work crew to make changes necessary for implementing the solution. Responsiveness to Homeowner’s Needs and Concerns: Adam’s commitment to homeowner satisfaction was evident in his actions. On the few occasions when we brought a request or concern to his attention, he listened attentively, and always took appropriate action that demonstrated responsiveness to our needs or concerns. Truth in Advertising: Adam presented us with an impressive and detailed Bid Book, to include PDF Prints, Spreadsheets, Scope of work, Letters from Subcontractors and their associated tasks and itemized costs, a Certificate of Insurance, Truss Designs, Building Permit Applications, and his contract. His contract was just as detailed in describing the work to be done, a construction timeline specifying a starting and completion date; a list of materials the bid was based on, and an explanation of warranties for fixtures and labor. When the project was completed, all the work was done as described and agreed upon, and there were no hidden costs, extra expenses or unpleasant surprises. As homeowners and customers, we felt Adam delivered exactly what he had promised, at the agreed upon price. Value: We solicited several bids for our construction project. Although Adam’s bid was not the lowest, we are certain that he delivered the highest quality work, for the best value, for the price he charge. We believe in the adage that you get what you pay for and we could not be more pleased with the end result. Sensitivity to worksite appearance and neighbor relations: Our project required a portable toilet (for the work crew), and there was very limited parking in our neighborhood (as well as construction of a new home going on simultaneously directly across the street). Adam’s placement of the portable toilet and construction materials was based not solely on function and convenience, but showed a consideration for the aesthetics of the worksite. The work crew parked their vehicles in ways that were minimally disruptive to the neighborhood traffic, and their conduct never caused any discomfort to our neighbors. In the five months during this project, there was not one single neighbor complaint! Instead, six or more different neighbors passed on compliments about the work crews and the garage. 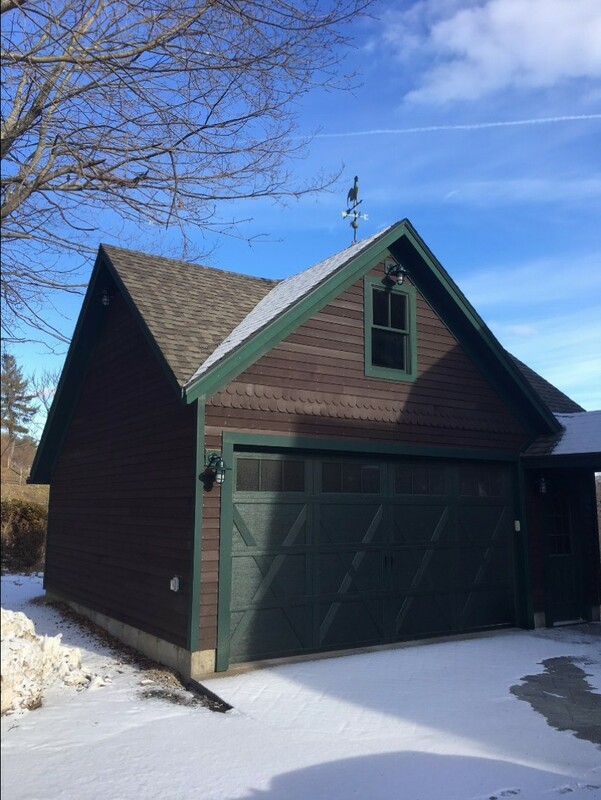 In closing, we are thrilled with our garage and breezeway and are extremely impressed with Adam Wood’s work as a General Contractor. My husband and I have been homeowners for over 40 years, and we took the time to write this Letter of Recommendation for Adam because we believe that his exceptional work should not go unnoticed. We would not hesitate to hire Adam again, or to recommend him to our friends, neighbors, and local homeowners and businesses. We recommend Adam Wood enthusiastically and without reservation. Adam is a rare find today - he is a man of integrity whose word is his bond. Beyond being a talented General Contractor and Builder, Adam is a delightful human being with a heart of gold, a willingness to please, and a work ethic that leads him to always go that extra mile for his customers and instills in others who work with him the desire to always do the best possible job and to do it with a smile. If you have any questions about our experience with Adam, please feel free to call us at 413-645-3246.